CB passive income 5.0 is a program founded by Patric Chan about five years ago. As the name suggest, it is clickbank related. Patric Chan is the author of ‘wake up millionaire and several other books. In his program, he teaches people how to generate money from the internet with clickbank. The program is pricey and has caused many to wonder if this CB passive income system is legit or scam. Patric Chan believes he is in the best position to teach you how to be successful online because he is also a successful online marketer. So in short, he will teach you how to clone his successful strategies online. 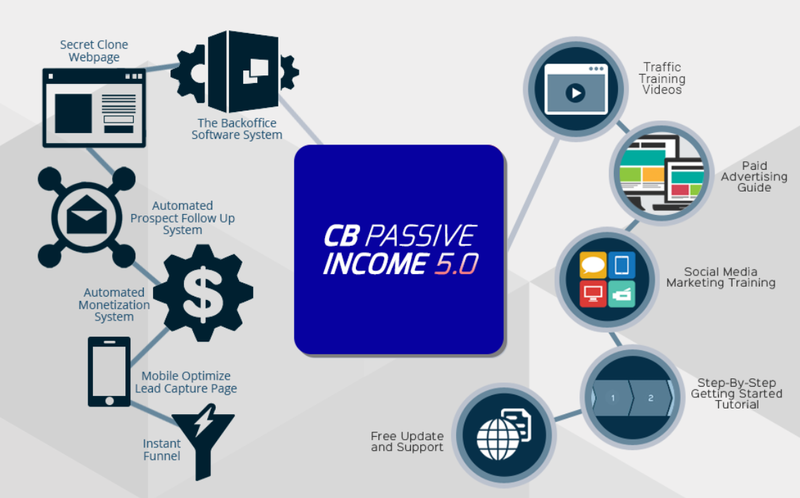 In this review of CB passive income 5.0, I will give you an objective view of the entire program and then my opinion about it towards the end. If you want a free way to learn about affiliate marketing, click here to join my #1 recommendation for free. CB passive income is a program taught by Patric Chan. It is an internet marketing niche education program that is supposed to teach you how to make money online on auto-pilot. Patric says this method is proven and has been making him money every day without fail. This program was launched in 2013 and the goal is to teach members how to duplicates Patric chan’s marketing strategies exactly. This will be attained by allowing members to clone Patric’s exact web-pages, product promotion, email marketing and every other marketing techniques. How does CB passive income work? Patric claims to have created many money making softwares and courses over the years and offered them for free to his customers through super-secret web pages which can’t be accessed from any of his official websites. The only way he grants access to this training and software is by subscribe to his email list. After a client subscribes to his list, he will send them lessons by email and also links to affiliate programs and product recommendations to buy. As his subscribers increase and begin to buy the products he recommend, he gets to make money. The products and affiliate links are all from clickbank. According to him, clickbank only promotes legitimate programs so he is sure any affiliate link and product he recommends to you is legit (be weary of this statement as some of the programs promoted by clickbank are shady). Basically, CB passive income 5.0 is an email marketing and PPC training course that will teach you how to build an email list and sell to them. The bigger your email list, the higher your return. As he says some of the products on clickbank pay commissions as high as 50%. How to come up with an attractive and free offer that will entice people to subscribe to your email list. He claims that his secret webpage can convert subscribers at almost a 50% rate. How to choose your domain name, build a website and set up an autoresponder. According to him, this can be very overwhelming for newbies to do by themselves. How to create course to provide to your subscribers. He says without this, you will lose subscribers and thus money. How to hire designers, writers and other employees. He says you should be ready to spend because you cannot make money without spending. He tells his members not to listen to Gurus who say you can run a solid online business successfully without spending. Where to find a guiding coach because he believes you cannot succeed as a newbie without one. How to build a system that will continue to make you money going forward. Patric Chan has been an online marketer since 2003. He has authored many books. One of his best books is clicking cash which he co-authored with Robert G. Allen in 2012. He claims that he was able to crack the internet make money code in about a year. A year after cracking the code, he was featured on google news for making about $21500 from home. Flash forward to now, he is the owner of this CB passive income system. He claims that with his system, you will only have to do one task, give away his ready made products for free through your unique affiliate link. Pay for his system and you will get a clone of one of his successful business webpages and the rest will be done for you. How does CB passive income actually work? First you join the program by filling in the required details inside the CB passive income dashboard. After this is done, your clone page will be generated for you in an instant. Then, you need to find ways to send traffic to your webpage. This could be either free or paid traffic. If you are successful in sending traffic to your webpage, you will be able to build your subscribers. The CB passive income system will then send targeted emails to this subscribers on your behalf. If these subscribers buy the products promoted to them, you will make clickbank commissions. It depends on how you look at it. First off, you are deprived of knowledge as you skip a lot of the steps of online marketing and only get to learn about ways to promote your personal affiliate links. You are taught to promote these affiliate links mostly through paid ads which is expensive. One of their favorite ads site is soloads. This is a method where you pay people with huge email list to promote your products or unique affiliate links. They do this by sending emails to the people on their list on your behalf. This pretty much sum up to spamming in my opinion. I get a lot of these annoying emails all the time. Plus, you are not guaranteed to succeed as you don’t have a lot of control over the emails sent on your behalf or much of the program. One of their best training are videos that show you how to set up your affiliate marketing account with social media. This is the one thing that gives you a clear picture of what the marketing process entails. From this training, it is clear that your success will come with hard work and in time. It is not going to happen abruptly as he seems to claim. CB passive income 5.0 teaches something useful to its members. It is however not as easy as they will let you think. You still have to generate traffic and believe me, this is the most difficult part of affiliate marketing. I will rather pay for a program that has a surefire way of generating traffic than pay for one that does everything else and make me do the hard work of generating traffic. You do not have control over how the program is run because it is not yours. You are buying and cloning someone’s program. You are also promoting his products not yours. All the above however, in my opinion does not make CB passive income 5.0 a scam. It is the hype that makes many people call it scam. No matter the program you join online, know that it is going to take time to make money. Give yourself at least 6 months. You can join one of my most recommended affiliate training programs for free by clicking here. If you like it after a while, you can upgrade to premium. If not, you can unsubscribe, no questions asked.